Police have fired tear gas at crowds in the Egyptian capital Cairo at a protest against a controversial deal to hand two islands to Saudi Arabia. 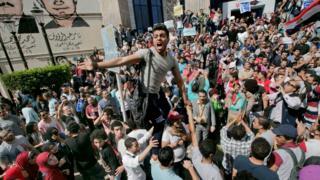 Thousands of protesters took to the streets to call for Egyptian President Abdul Fattah al-Sisi to resign. Mr Sisi has faced heavy criticism over his executive decision to give away the Red Sea islands, during a visit by Saudi Arabia's King Salman. The uninhabited islands have been under Egyptian control since 1950. The protesters in Cairo chanted "Sisi out" and "We own the land". Mohamed Hussein, an engineer, told Reuters: "I'm protesting because of the overall situation in the country, not just the islands." Some also chanted "The people want the downfall of the regime!" - a slogan from the 2011 Arab Spring uprising that toppled former leader Hosni Mubarak - as well as "Sisi - Mubarak". At least 80 people were arrested in Cairo and Alexandria, officials said. The White House said the US would watch the situation in Egypt, a key ally, carefully. Both secular and Islamist activists had called for people to demonstrate against the transfer of the uninhabited islands. Mr Sisi was forced to publicly defend his decision to give away the islands, Tiran and Sanafir, which are situated at the mouth of the Gulf of Aqaba. He said they had always belonged to the Saudis and Egypt had simply been asked to look after them. "We did not surrender our rights but we restored the rights of others," Mr Sisi said. "Egypt did not relinquish even a grain of sand. All the data and documents say nothing except that this particular right is theirs." Critics of the deal say Mr Sisi's decision to hand over the islands without parliamentary approval, and only announce the deal after it was done, was improper. Others have accused the president of giving the islands away in return for Saudi aid and investment. Mr Sisi has faced increasing criticism in recent months on a range of issues, including Egypt's lacklustre economy. The president, a former army general, previously enjoyed broad support after winning the election in 2014, but has faced a backlash in recent months.